For many years, Swiss Re has partnered with The Insurance Supper Club, a network of senior women in the insurance industry, in several key locations. In 2017, we hosted their Zurich Leadership Networking Event “Competence creates a world of opportunity – we shouldn’t be afraid to try new things”. 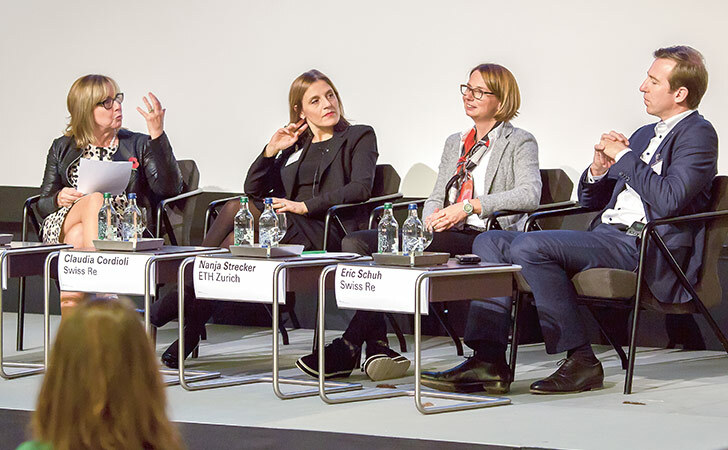 It provided senior Swiss Re leaders with a platform to exchange with colleagues from other insurance companies and share best practice approaches with respect to gender equality. Swiss Re is deeply committed to the United Nation’s Sustainable Development Goal #5: “To achieve gender equality and empower all women and girls”. At Swiss Re, we believe that increasing gender balance in leadership is a strategic imperative that is critical to our future business success. In 2017, we took several important steps toward building and fostering a gender-balanced talent pipeline. We are committed to closely monitoring the talent flows in the business and locations, ensuring we make steady progress toward our aspirations. We also launched a global sponsorship initiative designed to enable high-potential female talent to reach their career aspirations. Close to 50 executive members are actively engaged in one or more sponsor/sponsoree relationships. At our Swiss corporate headquarters, we reassessed ourselves against the EDGE best practice standard for gender equality (Economic Dividends for Gender Equality, www.edge-cert.com). This objective measurement strongly supports our global interventions, steering us towards implementing further gender equality best practices. Externally, Swiss Re continues to contribute to the advancement of female talent. We have a partnership with the association Advance – Empowering Women in Swiss Business, of which Swiss Re is a founding member. We again hosted their Annual Conference at our Centre for Global Dialogue. The event was devoted to “The Future of Leadership” and saw the launch of the first Advance Gender Intelligence Report Switzerland 2017.